06.30.2008 Monday: Posted New Things! 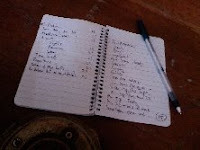 Picture of: the first draft of the new Etips list I am putting together. GTD folks will recognize the ubiquitous capture mechanism, don'cha? 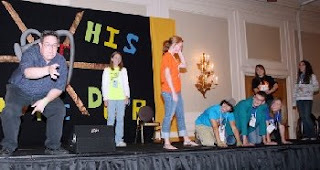 Picture of: me and some of the kids from the youth rally I did last week. Today I: discovered a blog of the Diocese of Beaumont youth rally, it had a couple of pics on it; worked on fine tuning a new storytelling promotional product, had lunch with my wife to catch up after the trip; did a number of family errands, gave in to the blech I have been feeling all day, going to lay low the rest of the day; I am sure the picture above is copyright by somebody in Texas but I don't know who. 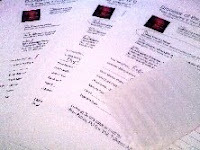 Picture of: order forms from my vendor table at the youth rally I worked today. 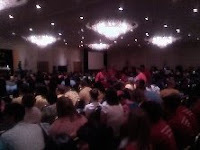 Picture of: the crowd (880 people) at the youth rally I am working this weekend. 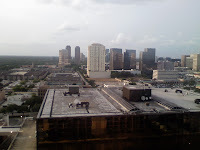 Picture of: the skyline of Houston, Texas from my hotel room balcony on the 23rd floor room. Today: I finished the packing up; drove up to the airport; oh, my it is amateur hour in the airports right now, lot of people travelling, lots of kids, lots of folks who still think the old rules of flying apply- it's a new world, fellow passengers, get with the program; made the flight across the southwest; played telephone tag to get picked up at the airport by a very nice person..thanks Linda; settled into the hotel; wandered the Galleria mall to find some food; working on Email and workshop notes for the youth rally I am speaking and storytelling; had dinner; winding up now and saying goodnight. More on Thursday. Today I In the last week I: have been writing, producing, coaching, running the biz side, contracting; thanks for checking in; I packed up tonight for my Houston trip; I am looking forward to sharing with you all the great things going on- so many new things for you, too! 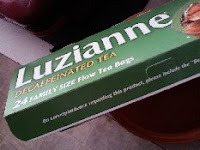 Picture of: the box from whence the black gold of tea leaves comes. 115f (45ish Celsius) today in the desert southwest- we are melting. 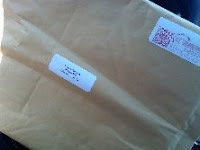 Today I: bought ice and other groceries; post offiiced; talked to a client about coming to our next "Outside In Storytelling Marketing Workshop"- she is; talked to another new client who will also be joining us at the OISBC in August; sent Emails to focused lists from the Storyteller.net site (listen); updated and added a new story to the Storyteller.net site; looked at my goals list from last week- must keep moving forward. 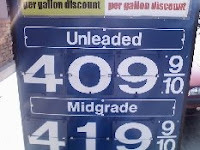 Picture of: why I don't want to leave the house. 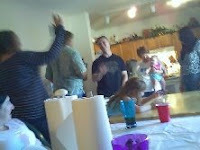 Picture of: parts of my family at the Father's Day party today. Notice that most of them are moving. Today I: ran to the store to pick up some last minute things for the party; partied with my family- smaller group this time, only about 15 people; went with my brothers to Sports Authority to pick up tips and flights- my BIL is a sanctioned darts player, the best any of us can hope for is second place; came back home, looked in my home office and thought: where do I start? ; sent out email proposals requests to Philadelphia area hotels for the Storyteller.net Live (Old flyer here)event in Philly on September 27, 2008; Happy Father's Day, Dad. 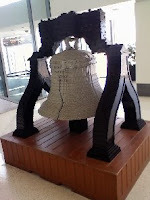 Picture of: a model of the Liberty Bell, this one made of Lego blocks and in the "A" terminal of the Philadelphia airport. Today I: grabbed the hotel breakfast; packed up my stuff and took the hotel shuttle to the airport; I actually liked both hotels this time around for this long trip; hung out for a bit in the USAirways club as I got to the airport really early; made the long trek from the C terminal to the A terminal- where I found the creation pictured to the left; flew across the country (back to Phoenix) in seat 10F while watching my Ipod, napping, looking out the window and generally trying to not engage my mind in much of anything for the 5 hours of flying; grabbed my luggage and met my family outside the elevators; took a nap; caught up on my storyteller Email; ate dinner with my wife; calling it a night. 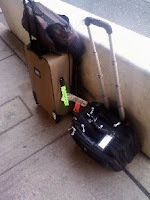 Picture of: my bags at the Philadelphia airport as I wait for the hotel shuttle to whisk me away. 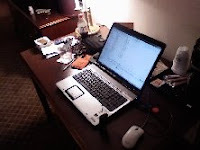 Picture of: my on-the-road office-in-my-hotel set up this evening. Today I: ordered room service breakfast 'cuz I was not going mess around with the waiting line for way-too-small breakfast cafe; took my walk through historic Philadelphia to the meeting space; participated in the coaching/marketing event here; walked back to hotel for dinner break to print things I had forgotten to print b4 I left home; broken printer service at desk, grrr, had to work through another hotel printer; back to the meeting and met with representatives from publishers, tv and radio- very interesting; got back to hotel to check Email after 10PM and rainstorm in Philly; answered new Emails; rewrote and sent out to one of my booking agents a new one-sheet for educators along with recommendation letters; wrote out a proposal for a possible joint-venture project with another participant; wife and I did proofreading and editing over the phone and internet, yay for three hour time difference; finally getting to bed really late. 06.09.2008 Monday: It's Always Sunny In Philadelphia. 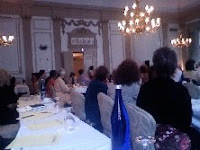 Picture of: the main meeting room for the "summit" meeting I am at (attending) this week for marketing/coaching/networking in Philadelphia. Today I: found a 20 minute wait for the breakfast buffet at the hotel so I went back to my room, ordered room service and got the meal in 30 minutes and cheaper than had I paid for the buffet; used that 30 minutes to review notes and the map for the event; walked over to the meeting space a few blocks away- directly across from the Liberty Bell and Independence Hall; used storytelling to introduce myself as as storyteller (what we teach in the OISBC! ); had many productive, networking conversations within a roomful of motivated, productive, energized people (because of the technique mentioned in the previous line); noted that the main speaker understands how to use storytelling but needs work on technique- at least he is consistently using storytelling to cement in his points; dinner in the hotel (great hotel- not enough meal service space or staff); caught up on email; deleted website spam; talked to my wife on the phone; reviewed notes from the day; heat wave in Philly today. In Arizona, we call this weather "July." And, no, it's not a dry heat; wishing I could sit down with every storyteller I have contact with and personally tell you how much I want you at the next "Outside In Storytelling Marketing Boot Camp" and just how powerful an experience it would be for you. Truly. Honestly. With Great Passion. ; goodnight. 06.08.2008 Sunday: Man, Are My Arms Tired. 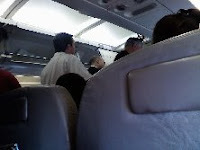 Picture of: flight 1192 PHX to PHL unloads at the end of a long flight. Today I: flew from my home to Philadelphia; read a great book on marketing during the plane flight; cab driver this time, as opposed to my last cab driver, said not a single word the entire time from airport to hotel; hotel room is rather large considering it is an east-coast hotel; checked into hotel; at dinner; reviewed maps and notes for Monday; talked to wife on the phone; went to bed. 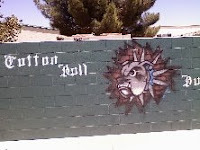 Picture of: the wall at the Cotton Boll Elementary School with their bulldog logo on it. Today I: performed two storytelling shows at the above school that was actually for another school that is doing their program at this school; had a great time with both groups of kids- lots of laughing; worked on some calendar things while sitting at Denny's sans tomato on my meal as apparently all tomatoes are poisonous now; took a quick nap to let me fibro head and my wounded voice (newbie mistake) settle down; returned Emails and phone calls; met a kid behind the counter at local restaurant who asked, "Can I ask you a question? Are you a storyteller?" It appears this young man made a few stops at our "Storyteller.net @ Borders" nights over the last year. Thanks, Josh. ; made grilled cheese sandwiches for family; watched BSG. 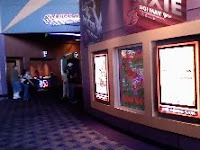 Picture of: the inside of the movie theater today. Today I: made the rounds to post office and bank; went with my wife and kids to see the latest "Chronicles of Narnia" movie- the book and the movie are only vaguely related; worked on several new emails; participated in a conference call about book marketing; did some research into a new printed directory someone is trying to pedal around the country; edited some sound files; prepped up a storytelling set list for a show on Friday; ate dinner at the local coffee shop with my wife. 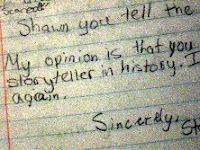 06.02.2008 Monday: "Greatest Storyteller in History"
Picture of: thank-you letter a 3rd grader wrote at school after one of my performances. Today I: dropped my kids off at the summer movies; went through my mail and found a package of thank-you letters from a school where I did five shows in a row- I love reading these little notes; went to lunch with my wife; worked with a new corporate storytelling client to get documentations to them about my two-decade plus experience in the field of storytelling; sorted through some new ideas for the next series of free conference calls at Storyteller.net- I will post that on Tuesday; cleaned out my suitcases from previous trips to get ready for next week's trip. 06.01.2008 Sunday: What Pond R U Fishing In? 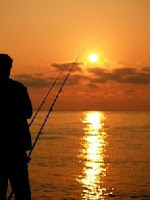 Picture of: some guy fishing. Today I: realized that I need to fish in the right pond. Let me know if you want to come with me or if you are happy fishing in the little pond. Are you ready for the big fish, storytellers?